Few days ago we posted a tutorial to flash Samsung B313e or Samsung B313e/d SPD mobile. And now we are going to share Samsung B313E IMEI repair process with Samsung B313e IMEI tool. If you are real owner of Samsung B313e or B313e/d mobile and now getting any null IMEI or Invalid IMEI or IMEI 00000 on Samsung B313e then this post may help you to fix IMEI 000000 on Samsung B313e mobile. Sometime, it may possible, you will face no network after flash Samsung B313e flash file or because of any software related issues. In that condition, type *#06# and check IMEI status of the device. If it’s sowing invalid IMEI or IMEI 0000 then continue the process and repair IMEI of Samsung B313e using Samsung B313e IMEI tool. IMEI repairing tool may be different for different devices and they depends on chipset of the devices. As we all know Samsung B313e Or B313e/d both are SPD devices. So we can use any SPD IMEI repair tool like WriteIMEI tool or Miracle tool etc. 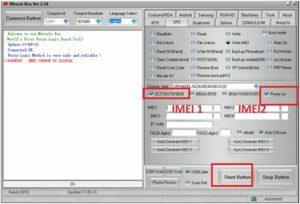 Here in this post we are going to explain two different methods to repair or change imei of Samsung B313e keypad mobile. Both process are working and tested, so you may apply anyone method to repair IMEI of your own Samsung B313e mobile. Here you can use any one method to repair Samsung B313e IMEI using free tool. This method is highly recommended to repair Samsung B313e IMEi. In this method, we will use free spd imei repairing tool – WriteIMEI tool. 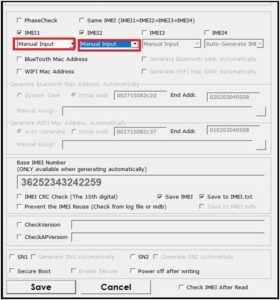 Users can flash original IMEI or can change IMEI on Samsung B313e using write IMEI tool. 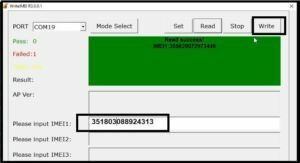 Flashing IMEI on Samsung b313e/d or B313e using Write IMEi tool is very simple. Just follow the below steps properly. First off all download and install “Samsung B313e USB Drivers or SPD Drivers” on pc. Skip the setp, if already installed. Download “WriteIMEI tool” from above download section and extract it on pc. Enter into extracted folder and run “writeIMEitool.exe” file as administrator. 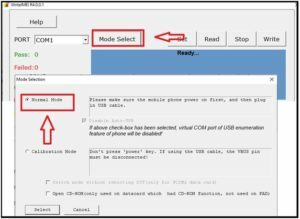 Once the tool opened, click on “Mode Select” option and select “Normal Mode” as shown below. Now click on “SET” tab and select IMEI1 or IMEi2, in case you want to flash both IMEI1 & IME2. Don’t forget to click on “SAVE” button to apply the changes. Come to the device, press Boot key + insert USB Cable to create port. 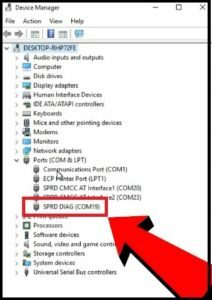 Device will connect with pc into diag mode and it will create SPRD Diag port under “device Manager”. Again go to write IMEI too, click on “Read” option to read current IMEI of the device. Finally click on “WRITE” option to flash IMEI on Samsung B313e mobile. Within few seconds, process will complete. Power off the device, remove and re-insert the battery and restart it again. Once the device reboot, check IMEI status of the device by typing *#06#. 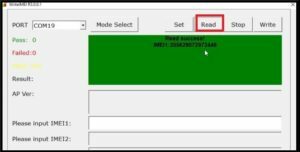 These are the complete steps to flash IMEI on Samsung b313e keypad mobile using writeIMEI tool. As we all know Miracle tool is one of the best tool to repair any android and keyped mobile. In the same way, you can also use free Miracle 2.27a or Miracle 2.54 or Miracle 2.58 and Miracle 2.82 etc. Basically Miracle tool is a professional premium tool but now you can get these version as a free software. That mens, you can use Miracle tool without box. Just go to above download section and get free Miracle tool without box. Here in this tutorial we are going to use free Miracle 2.58. Otherwise, you may also any version of Miracle tool. Process is same. Download and extract the downloaded “Free Miracle 2.58” on pc. Run loader to launch “miracle tool” on pc. Once the tool opened, go to “SPD” tab. Now press “CTRL” key + “M” to visible “IMEI” option in Miracle tool. Now configure the tool as shown below and then hit on “START” button to start IMEI write process. If the device is properly connected, it will detect the device and will flash IMEI automatically. Done!!! Reboo the device and check IMEI status of the device. 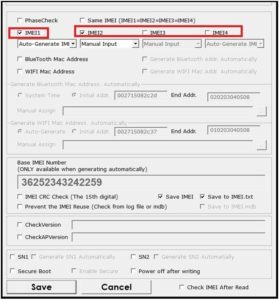 In this way, you can write IMEI or repair imei on Samsung b313e using Miracle tool. So guys these are all about Samsung B313e IMEI repairing methods. Use any one method to repair null IMEI or invalid IMEI of Samsung b313e mobile.